In most cases, your garage tends to become the dumping spot. A variety of items for which you do not have sufficient space in your home tend to land in your garage. These include different types of tools, garden and yard supplies, sports equipment and cars that typically occupy space. If your garage does not even have enough space for your car anymore, do not worry as you are not alone. As per a survey conducted by researchers at the Home Innovation Research Labs, nearly 95% of homeowners who participated in the survey, use their garages for storage and about 85% use them for parking their vehicles. Moreover, this study revealed that about 70% of garage space in most single-family houses is left for parking as the floor space is often occupied by various things other than a parked vehicle. months provide, it is a feasible time to implement a new and improved garage organization system and update the overall functionality and look of this frequently neglected space. 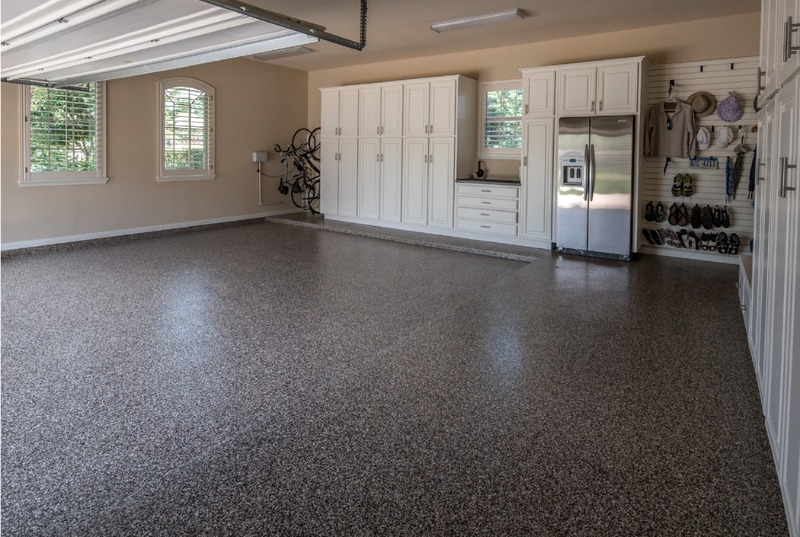 If you would like to create a more functional, cleaner and more organized space in the garage, here are some actions you can take to give your garage a makeover. When you begin a major overhaul or renovation of a room, it is often very tempting to hoard most of the stuff on shelves or in the corners. The problem with this approach is that it can cloud your decision-making and judgment, when you really have to consider your possessions objectively. It is likely that you have plenty of “stuff” lying in your garage. From lawn care tools and sports equipment to boxes from the time that you moved in several years ago, the list may go on and on. The best thing to do is take everything like tools and bikes out of the garage to a different storage space where you or others may sort through it. Choose a suitable day and take transfer all your stuff to your backyard or driveway. It would also provide you a great opportunity to donate or sell items that you do not need anymore, discard useless and unwanted items, while moving the rest of the stuff temporarily. It is advisable that you do this with a group of friends or family. This will make the job easy and quick. 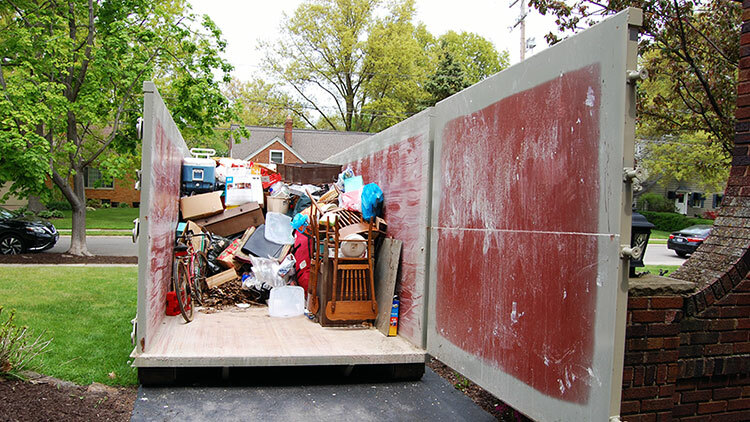 Depending on the amount of stuff you have to throw out and the size of the garage, you may have to rent a roll off dumpster (as shown in the picture above). If you properly stack various materials, it would give you enough room to remove everything. This is an ideal time for getting serious clutter and mess out of your life. The garage often becomes the clutter-catcher for the rest of your home. It is the space that most home owners stuff and dump things when they prepare for company or try to clean other rooms in the house. Sort your different items into various piles that you intend to sell, keep, donate and throw out. It is important to be realistic regarding stuff you want to sell to make sure it does not stay in the garage for another year. For items that you are planning to keep, make sure you further sort them into useful categories like sports equipment, holiday decorations, and gardening tools, etc. Try to donate giveaways as soon as possible. You can also schedule a yard sale in order to dispose of the items that you do not need anymore. Be careful when tossing out items such as household chemicals, which usually need special disposal. When everything has been cleared out of your garage, it is the right time to clean and sweep your garage. Take a good hard look at the various surfaces from bottom to top. Begin with the garage ceiling and wipe thoroughly. Sweep out all of the heavy debris and dirt. You can remove any grease and oil spots by properly covering them using either sawdust or cat litter in order to absorb any excess. Use a broom to remove cobwebs, and also make sure you wipe away all the dirt and dust that has accumulated in the corners too. With a hard or medium bristle broom sweep the garage floor and ceiling after about twenty four hours. Sprinkle a cleaning agent or dry dishwasher detergent on any stains. Pour hot water on the stained area and scrub it rigorously using a bristle broom. To get rid of more stubborn stains, you can use muriatic acid coupled with a good pressure washer. Then thoroughly wash the whole floor using lukewarm soapy water, and scrub the surface using a deck brush. (ex. this deck builder in Chicago does an excellent job, see images) It is important to rinse thoroughly; use a push broom or floor squeegee for removing any remaining water. Let it dry, and consider if the floor requires any painting or sealing. Repair any dents, small holes, scrapes and scratches with joint compound. You can also apply garage floor coatings. Keep in mind that professional floor coatings (like the one shown in the picture) have unmatched quality and make work simpler for you. Most professional floor coatings take just two days. However, an extra day might be needed if your surface has serious damage. You may also apply epoxy over your garage floor paint or over a previous coat of epoxy. You do not have the remove the previous coat; however, you will need to prep the floor surface. You can rent a top-notch floor buffer that has a sixty-grit sanding screen. Run your buffer carefully over your garage floor in order to get rid of loose paint. Then scuff the floor and create a smooth texture that the epoxy can stick to. Then thoroughly sweep your floor clean. And clean it using a degreaser, which can be found at home centers. The degreaser would help break the molecular bonds in the grease, causing it to come off your floor easily. Keep in mind that epoxy will not stick to floors contaminated by grease or oil. 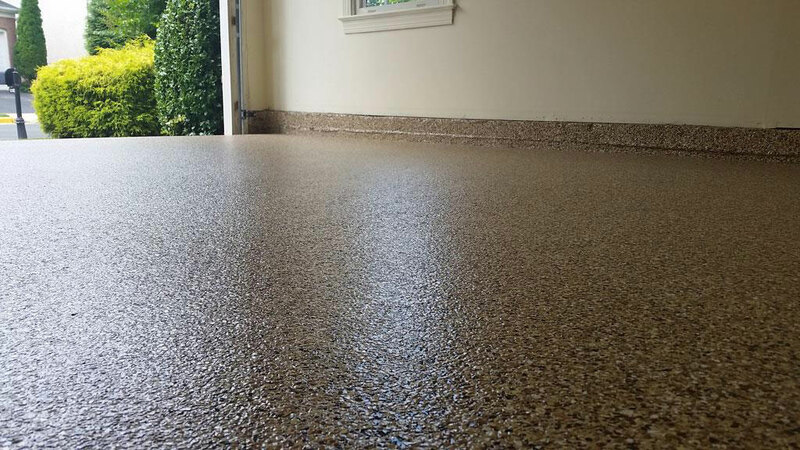 Allow the garage floor to dry for one full day, and then apply a coat of epoxy. There are a variety of options available when it comes to epoxy flooring. You can choose from faux granite to brightly colored tiles. In spite of the style you go with, the color and finishes available will let you carry over the interior style from your home to your garage. Similarly, you may design a completely new and customized theme for this area. A benefit of epoxy flooring material is that it comes with a five-year guarantee. In addition, the material is well known for its quality, durability and the unique ability to endure the usual activities that occur in the garage, making it equally functional and luxurious. In case you have not already, now is the time to visit the nearest home improvement store. You will need to invest in storage cabinets, shelving, clear totes, hooks and pegboards. The main goal here is to keep all items off the floor, when possible. It will help you clean the garage easily without creating piles. You should store similar items and equipment together like gardening tools and fertilizers, etc. Another great thing you can do is store bulky equipment such as snow blowers and lawn mowers in the corners. On the other hand, keep all the frequently-used items in places which are easy to access, and stash rarely-used or seasonal items in harder-to-reach areas such as top shelves. You can streamline your garage in a variety of ways which are discussed in the next section. You may get sick and tired of your different fishing rods getting jumbled or tangled. If that is the case you can use a simple fishing rod organizer. You just need a PVC pipe with a diameter of about three inches along with a swimming pool noodle (made of foam). Start by drilling 1-inch holes in the PVC pipe spaced about every 4 inches. With a small utility knife carefully make slits in your foam noodle; keep them about four inches apart. Line up your pool foam noodle on your garage wall in a way that two slits sit above the studs. Then gently pull these slits apart and carefully slide in a fender washer. Stack the swimming noodle to your wall using 2-inch screws. Now screw your PVC pipe carefully to the wall underneath at a reasonable height and slide the fishing rods. You can use plastic storage bins in your garage; this is because they are an ideal way to organize and separate your equipment by season or sport. The bad news is that they often get stacked against the walls, which makes reaching the bottom bins quite difficult, particularly for your household’s young teammates. However, a permanent and better solution is to build storage towers. They are not only easy to build, but are also an ingenious and attractive way to provide easier access to the bins. Springwater real estate. You can use bins of different color for different types of equipment such as sport equipment to make sure you find whatever you require in no time. You can also use the wooden frame sides for a variety of wall-mounted accessories like utility hooks or fishing rod holders for lightweight equipment. If you mount brackets, hooks and various other hardware, just on studs, it is likely that you are wasting plenty of opportunities. One of the best strategies is to include a layer of plywood (about ¾ inch) over bare studs or the drywall. This will give you a permanent fastening surface, allowing you to mount a variety of storage hardware easily and quickly. This way you will be able to arrange and organize more items in a space-efficient manner and squeeze in more stuff onto your walls. You can easily double your storage capacity with inexpensive hardware and plywood. A flexible and convenient storage wall system will solve two challenges. The first challenge is to design your storage area for the narrow or constricted alley between your car and your garage side wall. The second is to make a solid and reliable mounting surface in order to hold hooks and shelves which are able to carry hundreds of pounds of items and equipment. The simple and elegant solution here is to develop a framework of inexpensive shelf standards and horizontal wood strips. The structure will be able to hold nearly any arrangement of hooks and shelving, at various points on the wall; in addition, it is very easy to rearrange. Your DIY jobs (diy garage shelves) will not seem so bad if all your essential items have a dedicated space. A steel pegboard (like the one shown in the picture) will help keep rollers, brushes and tape etc. close at hand in case you have to tackle that paint project. You can use big plastic storage bins (as shown in the picture) to store items conveniently. Get them up off your garage floor and on the ceiling. Using 3-1/2-inch screws tack 2x2s to your garage ceiling framing with a space of about 2 feet. You can use these bins as a suitable guide for spacing your 2x2s. Keep in mind that the lips on your bins must slightly brush against the 2x2s when you slide the plastic bins into place. Then use 2-inch screws to center and screw the 1x4s to the 2x2s. Your garage ceiling is an excellent place to stash light to medium weight items such as camping gear and holiday decorations. Although it is quite simple and inexpensive to install garage shelving in the garage in order to organize various items, garage cabinets offer several important benefits that shelves simply cannot give you. A predominate benefit that a lot of garage owners quote as the key reason for opting for cabinets is that most cabinets feature convenient doors that can conceal or enclose the clutter in their garage, making it appear cleaner, more streamlined and, at times, even stylish, depending on the design and color of the cabinets. You can quickly transform the garage into an organized space from a cluttered mess using customized garage cabinets. These cabinets are available in a number of different sizes and shapes to meet all of your storage and organization needs. In addition, you will get some more benefits if you organize the garage space with garage cabinets. It is likely that you store a variety of tools, seasonal clothing or holiday décor in your garage. Without proper organization you will end up wasting plenty of time looking for the wrench, winter coat or holiday ornaments you want. On the other hand, if your garage is well-organized, everything will be in place, and you will save a lot of time when you are looking to find something. You will spend less money if you organize your garage using garage cabinets. In case you were to count the screwdrivers or hammers in your garage, how many do you have? Quit purchasing more screwdrivers simply because you cannot locate the ones you have. Instead, get organized and know exactly how many screwdrivers, hammers, wrenches, light bulbs or gardening tools you have and where you have kept these items. Your pocketbook would thank you! You may feel like your blood pressure will go through the roof when you look at your disorganized or cluttered garage. Lower stress by organizing your space and enjoy peace of mind. If you do so, everything will have an assigned spot, which will make it easier to find whatever you require, especially when you are in a hurry. As a result, your tidy and neat garage would be a place of joy rather than stress. Ideally, when you walk into the garage, you must be able to locate what you require in a couple of seconds. In case the garage is littered with cardboard boxes and random tools on the floor and other surfaces, it is time that you reclaim the precious space. Do not let that happen to you. Take charge to reduce or eliminate clutter and create a tidy, organized and neat garage. With garage cabinets, you will be able to similar items put various items in their suitable place and keep together. As a result, you will not have cleaning supplies on top of your favorite swimming gear. You will easily navigate your garage and find what you need. Keep in mind that a garage is the best place to keep everything from toxic paint to cleaning supplies. However, some of these items could become safety hazards in some cases. For example, if your child or pet accidentally licks an old paint can or swallows antifreeze, they can get deathly ill.
You can reduce the risk of accidental ingestion of chemicals, poison, and various other dangerous substances by storing these items in the cabinet that is locked or out of reach. These garage cabinets will protect your pets and kids from inhaling or ingesting something that is harmful for them. Also, cabinets will successfully keep all flammable or combustible materials safe. You could easily store these items away from any tools that may produce a flame or matches. You can also protect yourself from falls and slips with custom cabinets. In case a container starts to leak, the mess would be partially contained inside the cabinet rather than creating a mess all over your garage floor. The risk of boxes toppling on you will also be reduced if you install cabinets. You will not step on things such as a barbell or a rake when it is contained. Rather, all of your possessions will be neatly stacked and kept in a cabinet that will keep them organized. Another great garage makeover idea is to use more shelves in your garage to organize and store stuff. Functional and flexible garage shelving is an ideal storage option for a variety of items, such as toys, tools, painting supplies and cleaning supplies. You could purchase a conventional garage shelving system (like the one shown in the picture), which would hold everything from cleaning supplies to tools and equipment. Many people already have functional shelves in some obvious spots, but they do not install shelves in the corners. A nifty and elegant corner shelf (see picture below) can take advantage of your current studs, and it is also cheap and easy to set up. You can use oriented strand board or scrap plywood in order to make corner shelves that can fit well between your corner studs, while supporting them with 1×1 cleats. Also, these types of corner shelves are ideal for storing small items like oils, glues, waxes and polishes, which may get lost on large shelves. Storing various gardening tools and equipment, such as rakes, as well as cleaning equipment, such as brooms, can be a pain. In case you do not secure them to a wall, they are likely to end up in a pile on your garage floor, which can be unsafe and look ugly. However, if you secure them to a wall using PVC pipes (as shown above), they will be readily accessible whenever you require them, but will be out of your way when you do not. 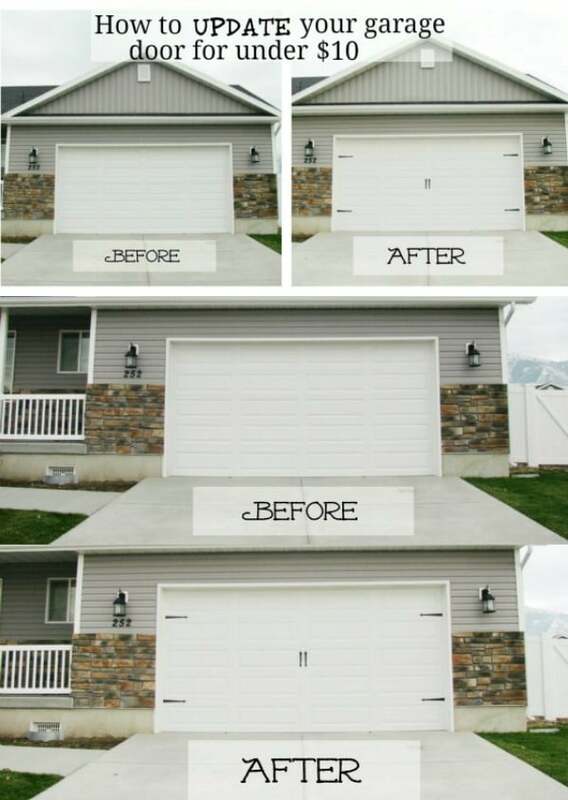 Adding some style and personality to the garage doors can instantly transform your garage. You may give your garage doors the rustic carriage house look without having to spend hundreds of dollars on actual carriage doors. A lot of home improvement centers and stores sell kits that allow users to immediately transform their garage doors. These kits are very economical and simple to install. Roll up garage doors are heavily used in both commercial and residential properties. You must have seen them at retail and convenient stores, schools, medical facilities and office buildings. Roll up garage doors open vertically and gather into a roll. These garage doors are ideal as they provide convenient and extremely easy access to the garage and keep your valuables secure. You can also choose from a variety of styles and materials. Whether you want to replace your old garage door or install a new one, you will not go wrong with a roll up garage door. These doors are an economical alternative to sectional garage doors and an ideal option when minimal backroom is available. On the other hand, a traditional steel garage door delivers great durability and performance at an extremely affordable price. Steel garage doors come with modern long panels or typical raised panels and in wainscot inspired designs. A coat of polyester paint provides low-cost maintenance with a finish that will look great. A majority of steel garage doors fuse the durable performance of top-notch steel with the sophistication of classic designs and clean lines. Therefore, whether you are looking to make a bold statement or a subtle one, there is a wide array of neutral and balanced tones available in the market that will blend well with the architectural elements of your house. Steel pegboards are convenient and functional and look stunning in the garage. So, if you require a handy and simple solution for storing all your tools in one place and prefer the steel look, steel pegboards are excellent and they are very economical as well. All you have to do is mount the steel pegboard to your wall and hang all your tools using steel hooks (as shown in the picture). You may also add small baskets and bins for screw and nail storage. It is likely that each member of your family has their personal bike. Although a single bike will not take plenty of garage space on its own, four to five bikes can consume significant space in your garage. 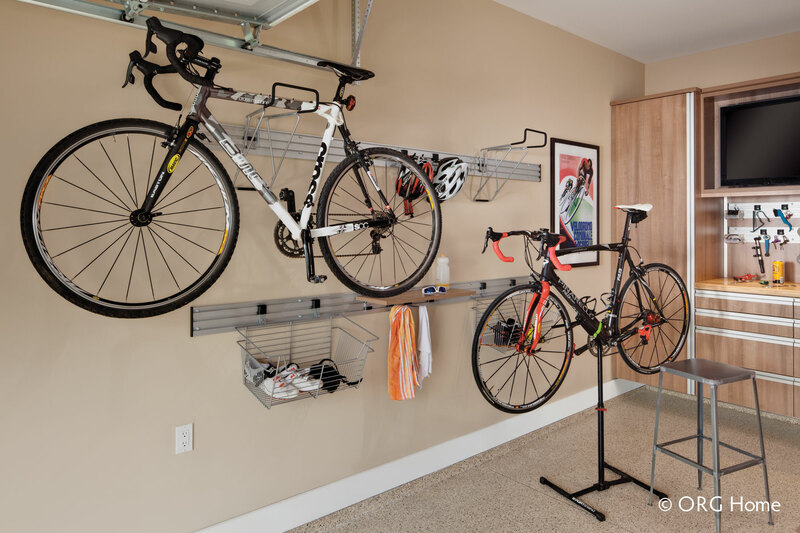 In this case, a great garage makeover idea is to add bike hooks. It is an elegant and simple addition to the garage that could considerably increase the ground space that is available to you. 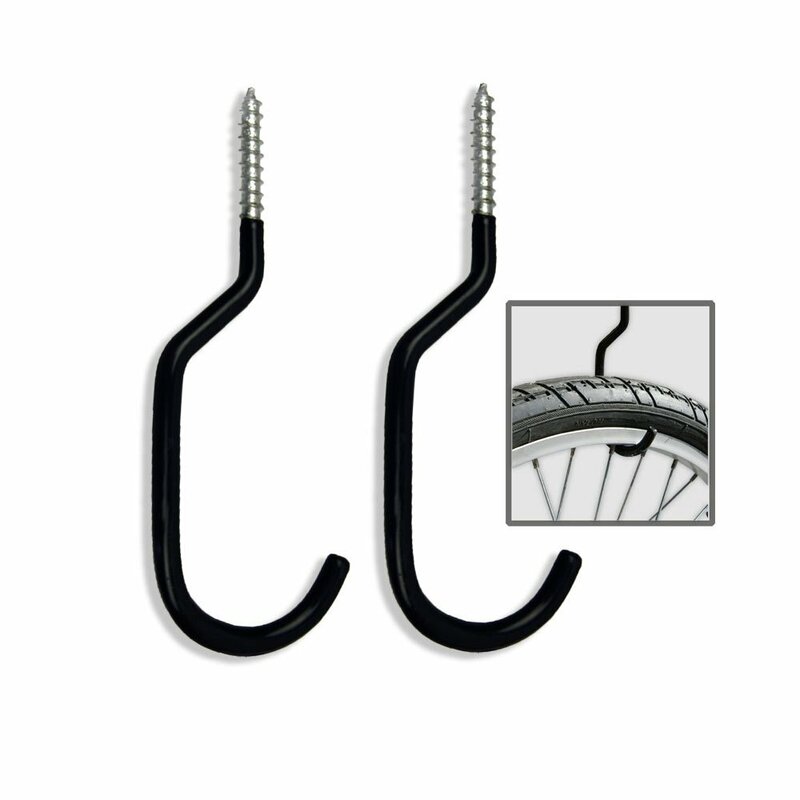 These bike hooks can hold your bikes against the wall securely; in addition, removing them is very simple you just have to lift them down. In case you have plenty of small tools such as drill bits and do not have enough room for a large toolbox, an easy solution is to add a small and convenient magnetic strip to your wall. The magnetic strip will help keep all your drill bits and other small tools perfectly organized and accessible so that you may quickly grab them whenever you need them. If you own a tool bench, it is an excellent way to keep all drill bits at hand and out of your way. The cost of remodeling or renovating your garage depends on a variety of different factors, such as the size of your garage, the type of renovation you are considering, the choice of materials, and the labor cost needed to complete your project. Irrespective of what kind of garage renovation project you intend to undertake, you would have to start by preparing your garage to be an improved living space. You will need to insulate the space and finish off the walls with sheetrock. In addition, you will have to add flooring and ceiling as well. Similarly, you may have to update any electrical circuits in your garage to support lighting and any tools and electronics that you intend to use in the new space. If you use a moderately-priced grade of materials and manage to complete most of the project yourself, leaving the technical aspects of the project to the professionals, you could prepare the garage space for about $3,000 to $4,000. Perhaps you just need your garage renovation project to cover a small part of your garage. This is usually the case when home owners are looking to create a fitness area, or only need to add some storage space or a closet. For a majority of small-scale remodeling and makeover projects, costs are usually very low and depend on exactly what has to be done in order to prepare your garage space for storing heavy items or or fitness equipment. In case you already have all of the fitness equipment installed inside your home, simply making one corner workout ready is all that is required. You can easily add storage cabinets to your garage space on a budget. In most cases, the average cost of a partial or small-scale garage makeover could range from $2,000 to up to $10,000, depending on the kind of accessories and materials used and the purpose of renovation. On the other hand, a complete garage remodel or makeover means that your entire space will be converted into a more organized and livable space. This will usually mean much higher costs. There are several examples of these complete-garage renovations, which include converting your garage space into a man cave or game room, converting your garage into a convenient home office or turning the garage space into a new apartment. Converting your garage space into an apartment could be the most expensive kind of garage remodeling project. Apart from insulating and preparing your space to make it habitable, you might need to update the current electrical circuitry and also add extra outlets along with lighting. As with any remodeling or renovation project, there are some aspects that may have an impact on the total cost of renovation. Whether it is getting building permits, adding doors, hiring different contractors, or getting the garage up to code, there are some cost considerations you must be aware of as a home owner. Every city has specific building codes that are applicable to all homeowners. A popular item a lot of homeowners may want to add when converting the garage into a bedroom or a living area is a new window. Keep in mind that building codes in the country require all living spaces to have at least one window. The window needs to be large enough so that a person can crawl out easily in the event of an emergency. In order to ensure the garage is up to code, go over all the design plans thoroughly with your city prior to the commencement of any work. If you are looking to vastly transform your garage, you will require a building permit from the authorities. The costs of permit vary depending on jurisdictions. Based on your location, a number of factors like the complexity and size of the project would affect your total permit cost. However, a majority of building permits cost about $980. With a lot of garage renovations and makeovers, flooring is often the main focus. A majority of garages are made fully of brick and concrete. And repairing a garage or replacing concrete could be quite costly. In situations where your floor or walls are extremely damaged, you may have to call a concrete mason. In this case, although materials will not cost a lot, working with concrete can be very time consuming; this is why you can expect a hefty labor bill. On the other hand, if the concrete slab in your garage is the main problem, there are several cost-effective options that are available to you. Most flaking, cracking, stains, wear or pitting could be easily fixed if you call a concrete specialist. The specialist will apply either a polyurethane-based or an inexpensive epoxy coating. The great thing about these seals is that they are extremely durable and could make the garage floor look new and squeaky clean. One of the main benefits of a garage renovation or makeover is the immense value it could add to your property. You could convert the garage into a media or fitness center, depending on how creative you are. There is a variety of designer-grade, elegant garage cabinet styles available in the market, which will meet all of your garage storage needs and also improve the aesthetic appeal of your garage and house. Another important benefit which is usually not immediately evident to most people is the peace of mind that garage remodeling can offer you. When the garage is visually pleasing, you would enjoy spending more time in it, and you would find it more comforting and relaxing. It is likely that you enter your garage several times in a day, and staring into a mess or clutter isn’t pleasant for anybody. However, by remodeling your garage, you could easily sort this issue, and add more value to the property. A garage specialist could help you redesign and organize your garage space so that it fits your specific needs. It will also help you declutter and provide storage and organization answers. With our comprehensive guide to garage makeover you can turn you garage into a more functional, practical, efficient and safe living space and store more items. The graphic design work of this article was sponsored by a local credit repair company in from Chicago, IL.